Piper Jaffray analyst Gene Munster put out a bullish note on Apple today after analysing the NPD data on Macs and iPods. 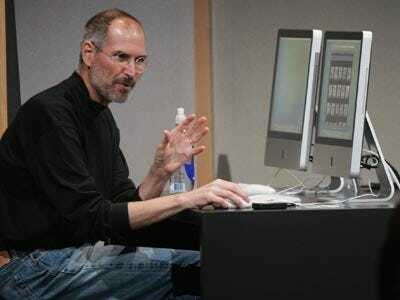 In short, he expects the Mac business to beat the street, and iPods to meet expectations. Gene thinks comparisons ease in the first half of this year, and sees it as a buying opportunity. He has a $284 price target on the stock. NPD Retail Data Suggests 2.8m-2.9m Macs For March Qtr. We have analysed domestic NPD retail data for the first 2 months of the Mar. quarter (Jan. & Feb.), which is up 39% y/y; it leads us to a Mac number of 2.8m-2.9m (we believe Street consensus is about 2.7m Macs in the quarter and we are at 2.6m). This data, along with our assumptions for the last month of the quarter and international Mac sales, implies y/y Mac unit growth of 26% to 31%, above the Street at about 22% y/y growth. iPod NPD Data Suggests Units Of 9m-10m For March Qtr. Our analysis of domestic iPod unit data from NPD for the first 2 months of the March quarter (up 7% y/y) leads us to an iPod approximation of 9m-10m (we believe the Street is at ~9m). This range implies y/y iPod unit growth of -17% to -9% vs. the Street at about -17% y/y. iPod units were up 7% y/y through the first 2 months of the March quarter, above Street consensus and up y/y for the first time in over a year, but we note that international iPod sales are a larger mix than international Mac sales resulting in a slightly greater margin of error from domestic NPD data.